We have lots of copies of "The Tale of Sinuhe" preserved from ancient times but no great idea about who first composed it or committed it to papyrus. It is thought to have been written about a hundred years after "The Shipwrecked Sailor", about the middle of Egypt's Twelfth Dynasty (1991-1782 BCE). The first idea about the author that might occur to you is that it was written by Sinuhe. It is a first-person narrative after all. However, it's a post-mortem first-person narrative, delivered from the grave, or from the mummy in the vault, as it were. This makes for an intriguing technique (like William Holden's dead-man's narration in Sunset Boulevard), but pretty well rules out autobiography. The next thought may be that someone else recorded Sinuhe's story and placed it in his mouth. Indeed, for a long time scholars considered the tale to be an historical account. However, no historical records of such a person—who left Egypt to become a power in another land and returned in a blaze of glory—have ever been found. And once you accept the narrative as a fictional or fictionalized story, you can see the various creative techniques employed. The author, or group of authors, obviously had literary skills. The references to the two reigning pharaohs apparently are genuine though, starting with Amenemhet I who was assassinated in 1908 BCE. The praise for the second pharaoh, the son Sesostris I, is so extensive—taking up an entire chapter at one point—while the announcement of the death of the father is so tersely correct, that we can speculate the writer was involved in the politics of the royal court, probably during the lifetime of the younger pharaoh. 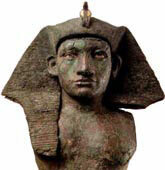 We can also note that an overriding theme of the piece is love of Egypt. Sinuhe's homeland is not only the object of his longing but is depicted as superior in almost every way to the semi-barbarian states surrounding it. The anonymous author is a patriot, even a royal propagandist, of the highest order.